Enjoy a thrilling helicopter pleasure flight over South Devon's Jurassic Coast and admire the natural beauty of Exmouth, Ottery St Mary, Budleigh's red cliffs, and so much more! Devon’s Jurassic Coast is one of Britain's most spectacular and beautiful coastal areas, so what better way to explore its sights than with a fantastic helicopter sightseeing tour? You are guaranteed to love this unforgettable helicopter pleasure flight over the Devon coast; exploring this remarkable area on foot is memorable enough, but seeing it from this unique vantage point is an especially exceptional experience – and one that you will remember forever! 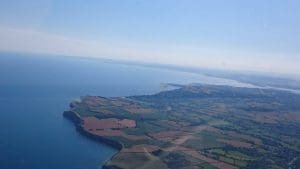 During this thrilling activity you will enjoy a 20 minute scenic flight, following the River Sid along to Sidmouth and then flying low-level alongside the famous cliffs of the Jurassic Coast, before moving on to sites such as Budleigh Salterton, Exmouth or Ottery St Mary. This incredible helicopter tour is quite simply the best way to see South Devon in all its natural splendour… you really can’t beat the exhilaration of viewing this dramatic area of coastline from a bird’s eye view, hovering thousands of feet up in the sky.On arrival, you will check-in with the ground crew and receive a full safety briefing. 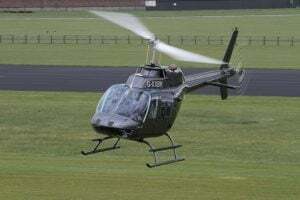 You’ll then board a helicopter flown by an experienced commercial pilot, where you’ll experience the amazing power of a chopper as you fly over the 34 mile circuit before enjoying a spectacular sightseeing tour along the stunning South Devon coastline. You could fly over sites such as the River Sid and fly low-level alongside the remarkable red cliffs, which form the majestic beginning of the Jurassic Coast. You’ll could then soar on to Budleigh Salperton for panoramic views over Exmouth, before following the picturesque Otter River to Ottery St Mary, depending on your flight route. There will be plenty of opportunities to take photos from the helicopter while you’re in the air, so don’t forget your camera! The Jurassic Coast and Devon Helicopter Sightseeing Tours take place on a selected Saturday or Sundays a month, subject to availability. The provider often shuts for December & January so please bear this in mind. These are extremely popular helicopter experiences which do tend to book quickly, especially during peak season. We recommend booking at least a month or two in advance, where possible. *Dates are updated regularly but availability are subject to change - if you'd like to check a date prior to purchasing or redemption, please contact our customer service team. There are no health or age restrictions for the Jurassic Coast Helicopter Sightseeing Tours, except children under 18 years must be accompanied by an adult, on site. 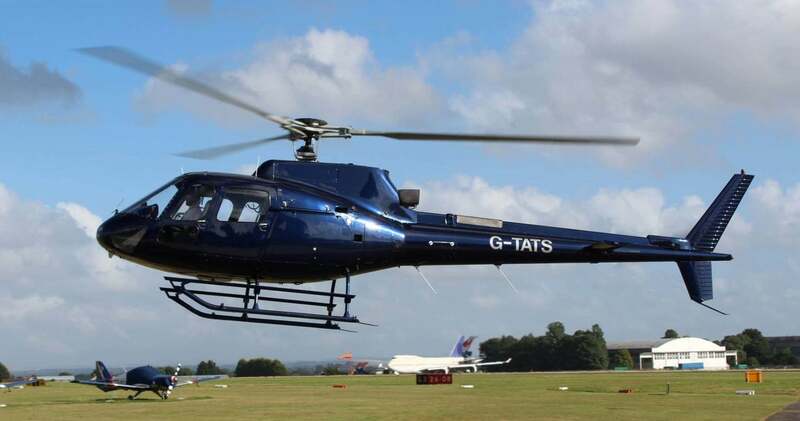 The Jurassic Coast and Devon Helicopter Sightseeing Tour is 20 minutes of flying time and is approximately 34 miles. Check-in is normally 20 minutes before the departure time, so please arrive early and give yourself plenty of time as there is a safety briefing and introduction before you board the helicopter. Participants: The Jurassic Coast Sightseeing Helicopter Tour is for 1 participant. Spectators are welcome to watch your Jurassic Coast and Devon Helicopter Sightseeing Tour, but will not be allowed airside. At most locations there is a cafe and viewing area. There are five/six passenger seats available on each flight. You should wear sensible and comfortable clothes for your Jurassic Coast and Devon Helicopter Sightseeing Tour. There is heating inside the helicopter and so outer clothing should be kept to a minimum. There is very limited space inside the helicopter so please avoid taking any handheld luggage or handbags. Ear defenders / headsets are provided. The Jurassic Coast and Devon Helicopter Sightseeing Tours are weather dependent. If the flights are cancelled due to bad weather, the centre will contact you to reschedule your flight for another day. Please call the centre after 8 am on the day of your flight for updated flight information. A first class and wonderful experience. This was made even better by the three members of staff at the airfield who were personable, upbeat, professional and helpful. Thank you so much for making this a special and memorable occasion for me. Booked for my 12 year old son for his birthday. He loved it! The weather wasn't the best but the tour was still brilliant, staff really nice and helpful. No troubles booking it up. Thanks Guys! Just one word "FABULOUS "
I really enjoyed this tour, and would certainly like to go back and do another. All the crew were friendly and the views were superb. It was an absolute pleasure. Thanks to everyone for making it such an enjoyable experience. Absolutely fantastic trip. The pilot was so friendly, knowledgeable about the coast and countryside and answered any questions. Would have given a score of 5 but the airfield was a real pain to find, just a gateway in some hedgerow with no signs. That said would highly recommend this experience. Really good experience, my flight was delayed due to bad weather but I was kept informed during the wait. Soon as the weather cleared we were away, excellent flight along the coast I could of wished for a bit of a longer flight, but nice to see the coast from a different perspective. A very enjoyable experience, well received ONCE we had found the site, the markers on the road had fallen down. I think the route could be better missing out threading a way through Sidbury and finding Hartbury Hill. howver, that apart we enjoyed the trip, many thanks. Brilliant awesome experience, one that will stay with me for a very long time. Very good flight over Lyme Regis .Dunkeswell is a good airstrip to be based as has excellent viewing and cafÃ©. We enjoyed our flight which was very smooth and efficient. We thought the pilot might have had a bit more knowledge of the area but nevertheless it was all very enjoyable. It would have been useful to have given the nearest postcode to the airfield for those with a SatNav. Well organised but didn't make the circuit as advertised - 'over Exmouth and back via Ottery St Mary' - instead it turned back over East Devon Golf Course and our family waiting to watch the helicopter fly over Orcombe point were disappointed too. Change of location from original acknowledgement made site difficult to find . No photo I'd asked for, or paperwork accepted for filing on arrival. Flight day message gave an earlier time of 13.30, on arrival this changed to 14.30. Our 14.30 seats were offered to another couple who acknowledged our name but this was remedied when I questioned ground staff. All staff very courteous and friendly, the flight was very enjoyable. Would recommend for security that photo I'd is required. Thank you for a lovely experience on the day. A Birthday present from my son & daughter in law. 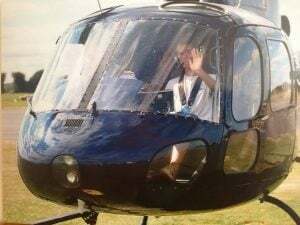 Something I would never have thought I could do, considering I don't like heights, but what a wonderful experience it was, and felt very confident and proud that I had finally flown in a helicopter - and would certainly do again ! My husband and I were delighted with our Helicopter Tour. it was a birthday present from our daughter, and the gentlemen who we met were very helpful and nothing was too much trouble . We would recommend you to anyone who was interested in a helicopter tour. I thoroughly enjoyed the experience,the flight and the view was stunning and the staff were very helpful and friendly. Would do it again. This was an excellent treat - the staff were friendly and helpful and all the information was well communicated. Amazing views and a super experience! What an enjoyable experience from arrival till leaving after the flight! The staff on the ground were polite and friendly. The pilot made us all feel safe and comfortable whilst making us chuckle! We were lucky to have good weather but a wonderful time was had by all! Just to say thank you for a fantastic adventure. Professional staff that are informative and courteous make for a thrilling yet relaxing experience.If you've ever thought about doing it then I recommend, if possible, that you sign up straight away. Miss out at your peril! Once again, a big thank you to all involved. Birthday present for my father who loved every minute, so much so, he forgot to take pictures! Fantastic! Would love to do it again. Just wanted to say a huge thank you to the team for making my parents first ever flight so special. To see the look on their faces when they returned was priceless. To top it off the weather was ideal for the flight. Bought this for my wife's birthday something on her bucket list. The whole experience was well organised, using professional staff who gave a day to remember. Thank you all for the service you provided it was 1st class and the weather was glorious. I have already recommended this trip and company to friends. A great experience and would highly recommend to others. Great value for money. Only slight negative is that we had to wait a while for our flight and also the pilot didn't speak much but was friendly enough. Overall a great day and my wife, who's gift it was for loved it ! This was a birthday surprise for a family member's 60th present. We gave him a bucket list surprise that he will never forget. He was highly delighted with this experience and did not want the experience to end. He now wishes to have this experience again at a later date. Thankyou so much for making his long awaited wish come true. Excellent service, excellent experience. ********** THANKYOU Very satisfied. Does the Jurassic Coast Sightseeing Helicopter Tour have a maximum weight limit? Anyone weighing 18 stone or over would have to pay for two seats on board the Jurassic Coast Sightseeing Helicopter Tour. How accessible is the Helicopter? Is there a large step? There will be a step-up into the Helicopter. If passengers for the Jurassic Coast Sightseeing Tour are less able-bodied, they will need to have someone to assist them getting in and out of the vehicle. If any further assistance is required during the flight, they will need to be accompanied by a fare paying passenger. How frequent is the Jurassic Coast Sightseeing Helicopter Tour? The Jurassic Coast Sightseeing Helicopter Tour runs once a month (occasionally twice) either on a Saturday or Sunday. They hold up to 5 passengers per flight. How long is the Jurassic Coast Sightseeing Helicopter Tour flight and how far do you travel? The Jurassic Coast Sightseeing Helicopter Tour flight covers roughly 34 miles and lasts around 20 minutes. Can you sit at the front next to the pilot when flying the Jurassic Coast Sightseeing Helicopter Tour? The front seat is subject to availability and comes at an additional fee. This is currently at Ã‚Â£30. The maximum weight limit for the front seat is 14st. Can you extend flight times and can my children come along? Unfortunately, you're are unable to extend flight times as these are set times on set dates for other members of the public as well. Children under 18 years must be accompanied by an adult, on site but are more than welcome to fly. It is not possible for children to sit on a lap; everyone must have and pay for a seats. When does the Jurassic Coast Sightseeing Helicopter Tour run? The Jurassic Coast Sightseeing Helicopter Tour takes place either one Saturday or Sunday a month and throughout most of the year excluding two to three months over winter.